Read about Heritage Day, an Eagle Scout project, the Byrd Collection and an addition to the Post Office Museum in the latest edition of the Footprints of the Past newsletter. 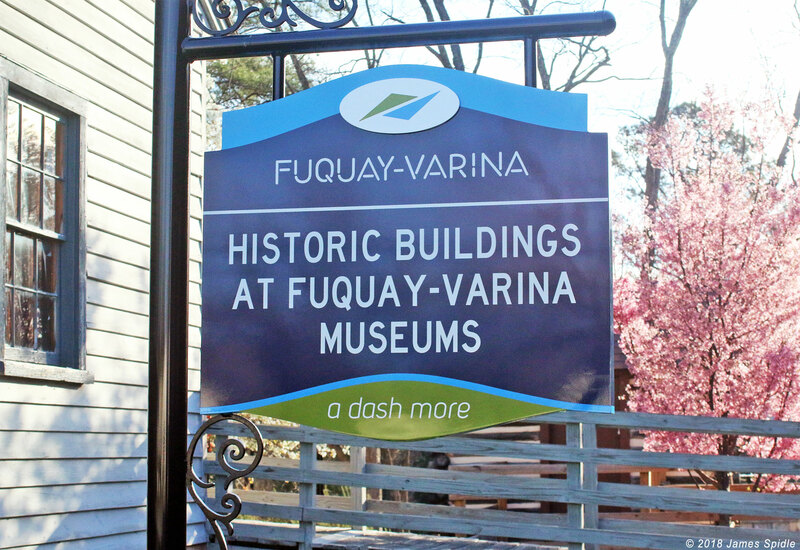 The Fuquay-Varina Museums Complex consists of five museums: The First Fuquay Post Office, the “Squire” Ballentine Schoolhouse, the Centennial Museum, the Tobacco Barn, and the Johnson Playhouse. We await the sixth museum: The Norfolk Southern Caboose #375. Tours may be arranged for groups by appointment. Please use our Contact form to request a tour. The museums are located one block off Main Street at 131 South Fuquay Avenue and are easily accessed with handicap facilities. When visiting the museums, please start at the Centennial Museum so that a docent can guide you on your tour. The post office and school are not typically staffed but a docent from the Centennial Museum will gladly provide access to the buildings and answer any questions you may have. Lunch can be arranged at several places in Fuquay-Varina. Contact the volunteer director for suggestions and arrangements which are complimentary to your tour group or suited to your needs. Senior tours work best with a visit to the museums, followed by lunch, and a step-on tour with a docent on your mini bus or van during the afternoon. 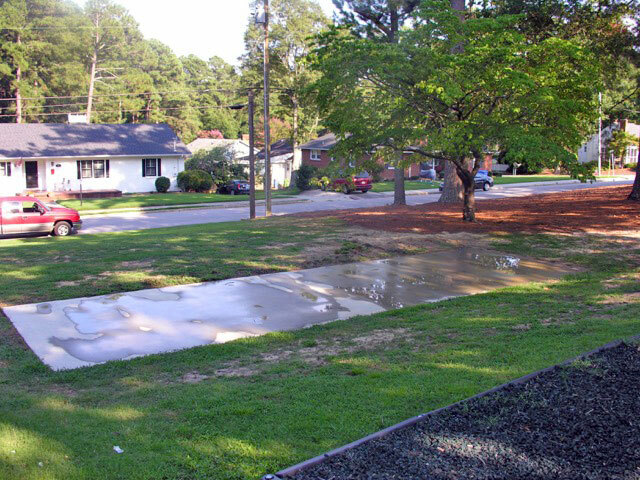 Visitors may also explore the two historic districts of Varina and Fuquay and visit the delightfully landscaped Fuquay Mineral Springs. If you would like to support the Museums, please consider joining the Friends of the Museums using this form. Free admission! Parking available! A good picnic site! Quaint Shops! Good food! Come spend the day in Fuquay-Varina! This particular piece was rescued and restored because it ran through Fuquay-Varina. Eventually it will be joined by our reconstructed first depot. 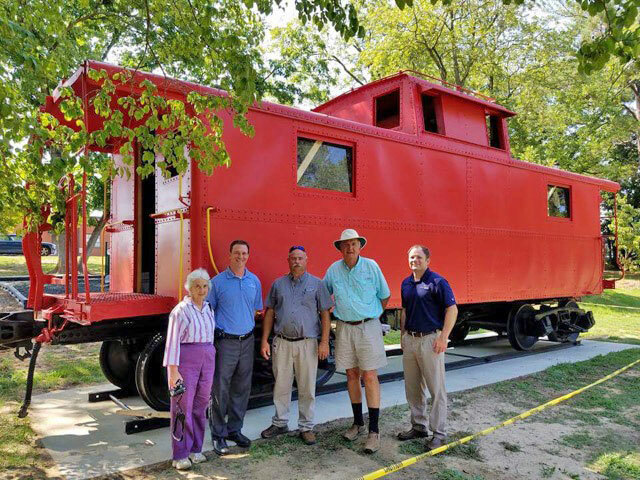 One of 12 purchased by Norfolk Southern RR in 1940, we are using this caboose to educate the public on the purpose it served. 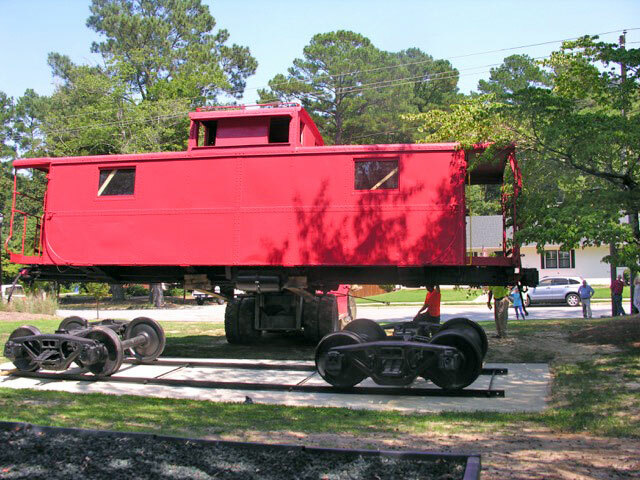 The caboose is a piece of history which is almost non existent today. You can follow the restoration process for NS Caboose #375 on Facebook. 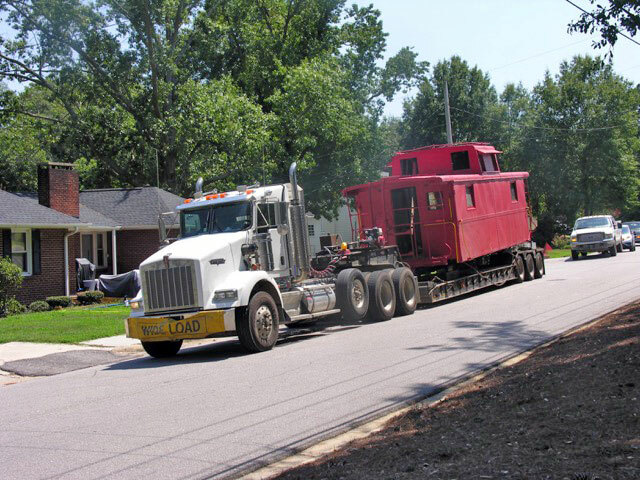 The Caboose has arrived at the Museums! HERE’S HOW THEY MOVE A CABOOSE! 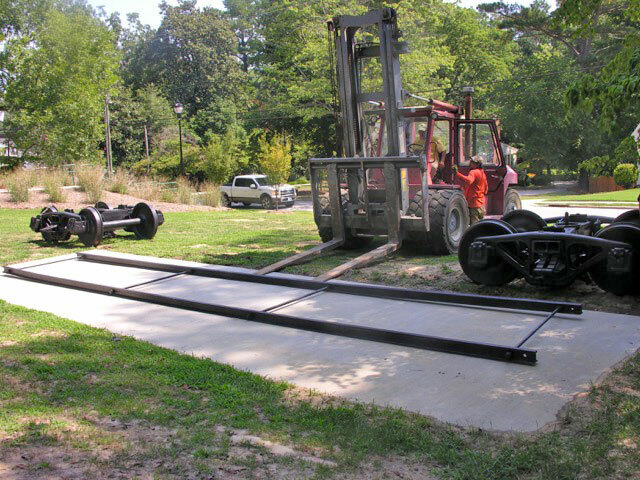 The trucks (wheels) placed at each end upon which the caboose body will be set down. And here comes the caboose body on a big truck! 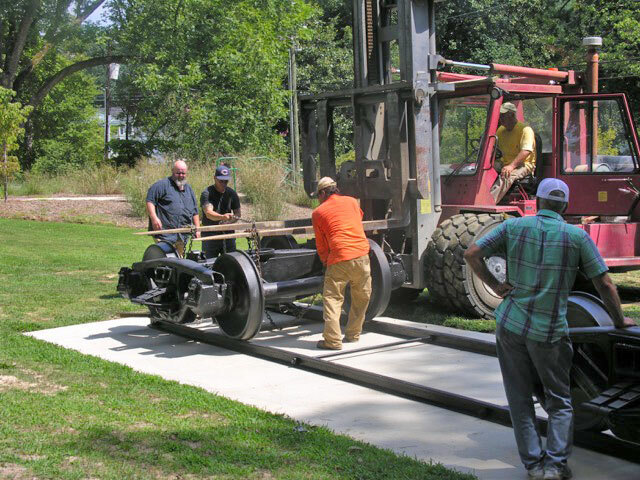 Lift the caboose off the truck, drive out from under it and turn it around to bring into the park. 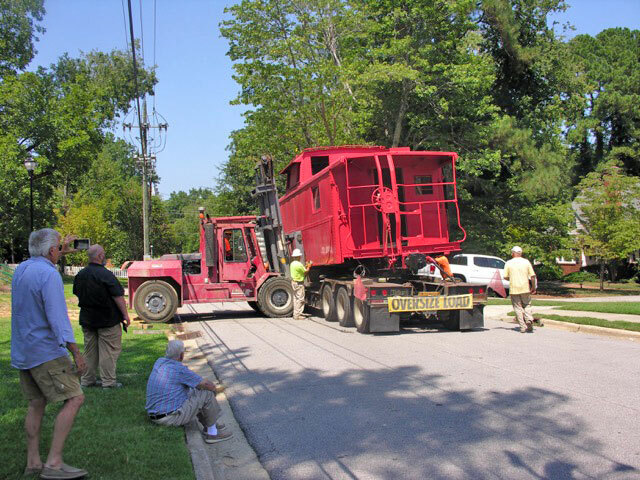 The body gets lowered carefully onto the trucks (wheels) for it’s final location. The caboose is on site in the beautiful park. Everyone is proud of the successful move! The Caboose is currently available for outside viewing only as the interior restoration is still in progress. No tours can be provided until the interior is restored. Visitors are asked not to trespass until work is completed.